States are struggling mightily to fund Medicaid services in one the deepest recessions in recent history, according to a 50-state health care study released by the Kaiser Commission on Medicaid and the Uninsured. States, many of them strapped by budget shortfalls, overwhelmingly reported being saved by the federal stimulus package, and said without it, they would have been forced to make serious cuts in Medicaid eligibility. Kaiser Commission on Medicaid and the uninsured. 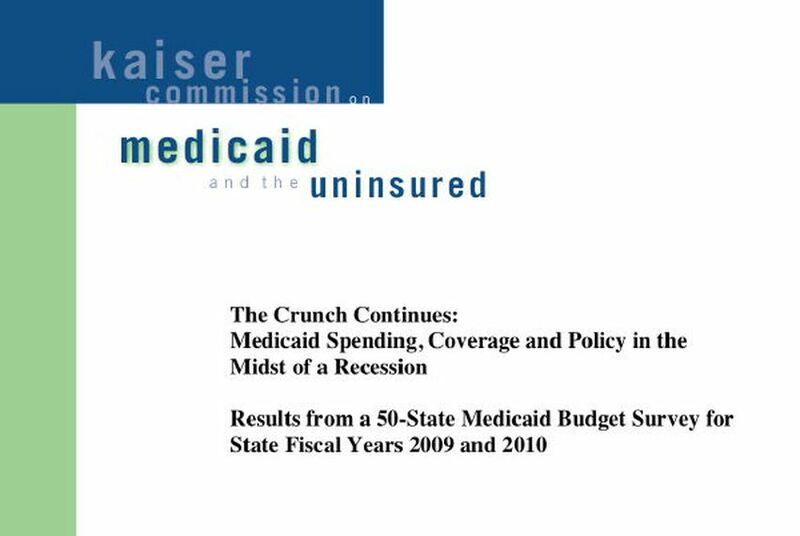 Report: The Crunch Continues: Medicaid spending, coverage and policy in the midst of a recession. Results from a 50-state Medicaid budget survey for state fiscal years 2009 and 2010. States are struggling mightily to fund Medicaid services in one the deepest recessions in recent history, according to a 50-state health care study released by the Kaiser Commission on Medicaid and the Uninsured. States, many of them strapped by budget shortfalls, overwhelmingly reported being saved by the federal stimulus package, and said without it, they would have been forced to make serious cuts in Medicaid eligibility. "Stimulus funds preserved Medicaid funding for millions of beneficiaries," said study author Vernon Smith, a principal with Health Management Associates. Still, 38 states reported making rate cuts in the last fiscal year to fund an average 5.4 percent increase in Medicaid enrollees — a surge fueled by rising unemployment. States like Texas commonly turned to other cost saving measures, such as relying on preferred drug lists, expanding managed care and using electronic medical records. But many states said they said they fear it will be a long time until the economic recovery curbs their uninsured populations. They expect Medicaid enrollment to grow by an average 6.6 percent this year — the largest hike rate since 2002. And they worry about the effect a federal health reform bill will have on Medicaid eligibility. "We know the recession has had a huge impact on state budgets," said Robin Rudowitz, principal policy analyst at the Kaiser Family Foundation. Demand for services is rising "at a time when states can least afford it." The border counties are, unsurprisingly, the hardest hit. Of counties with more than 20,000 residents, Hidalgo County tips the scales with 38 percent of its population uncovered; Webb County has a 36 percent uninsured rate. Of the state's five largest counties, Dallas has the worst uninsured rate, at 30 percent — despite being flanked by two of the best-insured counties in Texas. When it comes to uninsured children, the Texas panhandle fares as poorly as the border. Central Texas has higher rates of insurance than any other region in the state, the result of a high concentration of government jobs. Bell, Brazos and Coryell counties all have more than 85 percent of their residents insured.